Today's pearl of wisdom has been inspired by a bet on the Racing Consultants (http://racingconsultants.co.uk) tipping service last week. This bet has been the talk of the office because we got so many emails and opinions in about it. 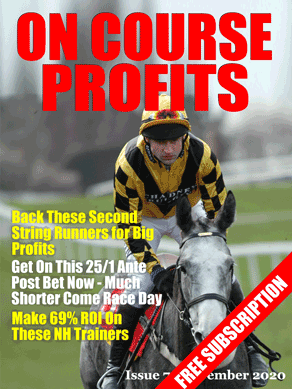 2.15 Wincanton – 2pts lay Silver Commander at 2.76 in running. The one that caused the fuss was Taaresh, this is what David wrote as his reasons for making the selection. An angle we like to use on a regular basis is a horse that's improved or refound it's form over jumps that then reverts to the Flat with a mark that looks on the low side, and Kevin Morgan's evergreen TAARESH fits that bill nicely here. Winner of a competitive 0-120 at Worcester that's worked out quite well, he followed that up with a win off 7lb higher and in better class at Wincanton, a sign that he's clearly in good heart at the moment. Upped in class again for his latest start at Musselburgh, he was far from disgraced in finishing fifth, just getting outpaced in the last quarter of a mile. Back on the Flat and in a low grade handicap, he looks well treated off just 70 here and as a C&D winner for Joe Fanning in the past, has no issue with the conditions either. A slight worry we have is the lack of pace in the race, but that is only a minor one, as he does travel well in his races and isn't short of pace should it turn into a burn up in the straight. You'll note that the price available at the time the bet was posted was 8/1. By race time he opened up at 16/1 and drifted out to 25/1! So the question is, if you hadn't already had your bet placed and a top service tipped you a horse at 8/1 that was now 16/1 and drifting to 20's then 25's would you have bet it? And would you still have your full stake on it? Or would you assume that it had no chance because of the price and not bet only to watch it win. So many people will not bet a horse that drifts because they see it as a negative sign. Gamblers who make money from their betting would see it as a good sign that they are getting extra value! My advice is if there is sound reasoning as to why a horse should be a selection then your only concern with the price is that you get the best price that you can. We bagged another 3 winners last Friday although it was frustrating to see Trustan Times being badly impeded while in the process of running a big race in the Fixed Brush Hurdle on Saturday. Still, that’s racing for you and we move on. This week we take a look at a trainer with a fantastic record with his hurdlers and I will tell you where my money is going in the Hennessy Gold Cup on Saturday. If you want a system with consistency then take a look at the yearly breakdown of John Quinn’s hurdlers at the courses we identified above. We have racing at Musselburgh this afternoon, so today I'm going to revisit the pointers that Nick Hardman gave us a few weeks ago regarding trainers at this meeting. Nick pointed us at a number of trainers that perform well at Musselburgh, with details of what types they excel with. One of those trainers has runners today so we will look at the stats for Philip Kirby. Nick's advice was to back Philip Kirby handicappers over 7 furlongs and longer. All of the non Handicap runners have lost. The other pointer was to only bet at 7 furlongs or longer. In fact there have only been two runs at below 7 furlongs, both lost. Following the prescribed rules would have given the following returns over the past 4 years. But from 6 races Stall 2 had wins at 4/1, 1/1, 8/1 so a tenner on each race would have returned £160, £100 profit. There was also a 2nd at 9/2. The next meeting at Pontefract is on April 30th. Last week we put up our early season trainers system and I've just seen that Kieran at Make Your Betting Pay has put up a similar post. One of his trainers also features on our list, but he has two that aren't. Kieran advices backing Roger Charlton trained horses in April and May and also Ralph Beckett charges.